When I was a child, I enjoy running around the rice field, balancing on a very narrow mud road as I keep running fast chasing grasshoppers, butterfly, bumblebee or dragonfly. When I was not running, I enjoy catching dragonfly through their wings. I would put sewing tread on its tail and let them fly. I would imagine flying with them riding on their back while I would run fast. My mother would warn me. "Don't play with the dragonfly for they are warriors from the other dimension where fairies live. They will turn you into a bullfrog if one of their kind died." From then on I stop catching dragonfly for I don't like being an ugly bullfrog. I started catching fireflies for they are beautiful together lighting my tree. I would put them together in a jar, to appreciate their beautiful light. My mother warned me. 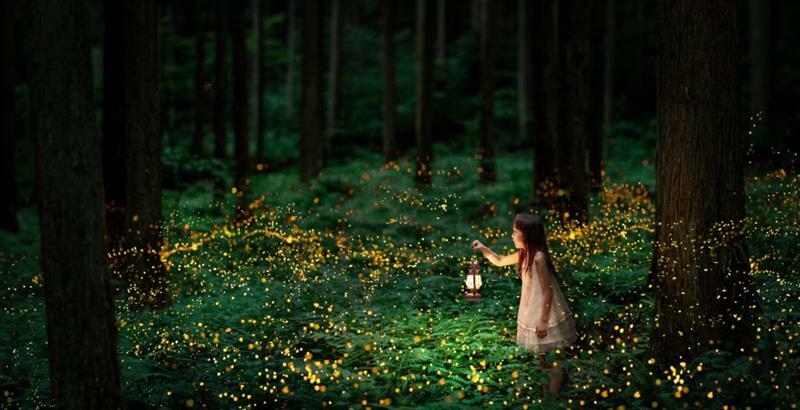 "Fireflies are dreams of the children that someday will come true. If you catch them your dreams will not come true." From then on I stop catching fireflies for I want my dreams to come true.